Expander Plugs for Hydraulic Applications - Bolt Products Inc.
Bolt Products is your wholesale distributor for all your Expander Plugs and associated Tools. KOENIG-EXPANDER® Plugs are very effective for closing drilled holes in hydraulic applications that use fluid power technology, such as integrated hydraulic circuits, or manifolds. The corrosion-resistant plugs for offshore and marine applications are used for drill head safeguarding and trawler fishing gear. The expander plugs are available in different Product Series and come with associated tools. MB Series - For use in base materials of both low to high hardness with Blowout Pressure exceeds 40,000 psi. No tapping or reaming of holes required. LP Series - A low pressure sealing plug installed into a tapered hole. The surface-hardened but flexible plug achieves anchorage by gripping the hole wall. SK Series - Anchorage is achieved by the serrations on the outside of the sleeve anchoring into the base material, especially in soft material. Working pressure to 7,250 psi. MB Setting Tool Plug setting tool to be used with MB Series installations. 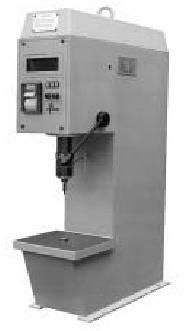 Hydropneumatic Table Press for the installation of MB Series and LP Series Koenig Sealing Plugs. Table Press with stroke control but without installation force monitoring. Graph printing capabilities and data output. 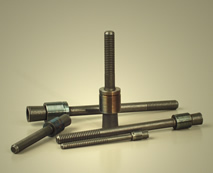 If you have questions or require assistance finding the KOENIG-EXPANDER plug products you need, please contact Bolt Products.